International Trade and Industry Minister Datuk Darell Leiking visit to Honeywell Technology Experience Center (HTEC) in Washington DC (fourth from rigth) was joined by InvestKL chief executive officer (CEO) Datuk Zainal Amanshah (third from left) and Malaysian Investment Development Authority (MIDA) CEO Datuk Azman Mahmud (second from right), together with other senior officials. Honeywell, a Fortune 100 global technology and software-industrial company, has reaffirmed its strong commitment and continued contribution towards the growth and development of Malaysia’s Industry 4.0 agenda. This was shared with International Trade and Industry Minister Datuk Darell Leiking during his visit to Honeywell Technology Experience Center (HTEC) in Washington DC, the US. Leiking was joined by InvestKL chief executive officer (CEO) Datuk Zainal Amanshah and Malaysian Investment Development Authority (MIDA) CEO Datuk Azman Mahmud, together with other senior officials. The delegation was received and hosted by Honeywell government relations global vice president Elizabeth Rossman. Leiking said the ministry continued to look out for best practices in innovation, technology, industry and manufacturing that Malaysia can adapt to its growing industry 4.0 plans. “A successful innovation ecosystem is one that allows multinational companies (MNCs) to thrive and at the same time, enables small and medium enterprises (SMEs) to be successful in niche markets and become respected sources of economic strength as suppliers to MNCs and as exporters. “Malaysia is already on track to achieving this. An important factor in ensuring success is working with industry partners and global players like Honeywell to enable SMEs to make continual incremental improvements in processes and products that help them move up the value chain. This in turn translates into sustained competitive advantages,” he said in a statement. Honeywell chairman and CEO Darius Adamczyk visited Malaysia last year and met with key customers and senior government officials. Adamczyk said he was feeling positive about Malaysia’s aim of being a primary destination for high-tech industries and its plans for technological innovation. 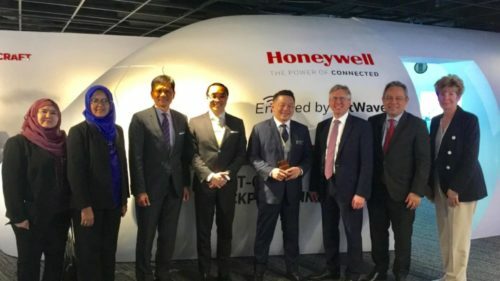 “Malaysia’s Industry 4.0 agenda has provided Honeywell with the welcome opportunity to partner with government entities, local SMEs, suppliers and other key stakeholders to help address the region’s growing demands for energy efficiency, sustainability, safety and productivity in the places where people live, work and play.